i want to inform you that Chris Witchhunter died last Night. A few hours ago we received a message from Witchhunters Mom that Chris is dead. We are shocked and stunned this time but we want to tell all Sodom Fans that one of the founding Members of Sodom gone forever. At first we thought that this is not true but by the tears of Chris Mom… it´s true! 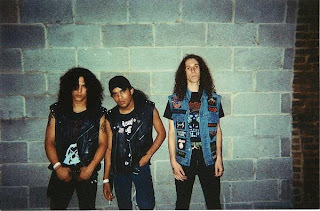 Amazing and Brutal Thrash Metal band from New York, fast as hell, cool riffing and aggressive voice is the perfect combination for a great Old School Sound, they have one EP called "Beyond The Morbid Gates" and one Split with Atomic Curse. They remind me bands like Morbid, Demolition Hammer, early Sepultura, great stuff!! !